sit for any length of breakfast-time in look mum no hands, eagerly devouring what i truly believe to be the finest muesli this side of easter island, and it's hard not to note the constant stream of cyclists heading along theobalds road, making their way to another day's work in the big city. and though perhaps less predominantly velocipedinal, a similar sight can be seen from the large front windows of siempre bicycle cafe adjacent to kelvin hall underground station in glasgow. though there's probably still a majority misguidedly heading to work of a morning by motor car, bicycle usage has noticeably increased over the past few years. unfortunately, on certain occasions, the two methods of transport don't mix too well. it has always seemed a tad incongruous that the hapless cyclist has been on the receiving end of criticism over the darkness of his/her clothing, while black motor cars receive not a single derogatory comment. granted, it's hard to deny that motor vehicles of whichever colour are nowadays lit up like a christmas tree, but in the arrival and departure melee, all those lights from each and every direction can't help but cause some confusion for everyone intent on using or crossing the roads. though we as commuting cyclists may not be the progenitors of this confusion, in light of our relative fragility it is left to us see and be seen. though recent research has undermined the perception that black is a less favourable shade in which to be clothed, it's likely that brighter, more fluorescent colours wouldn't do any harm, provided they suit your complexion. if the selfsame fluorescent jacket happens to be peppered with reflective logos and random looking triangular shapes, the miasma of motor car lights will have something off which to bounce. the result is unfettered visibility and hopefully increased safety for the cyclists. 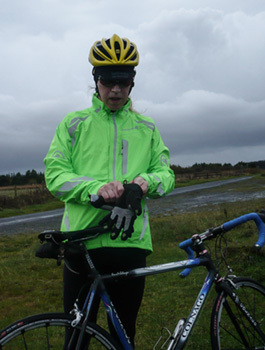 however, brightness of being and reflectivity are only one part of the equation; vanity and style are every bit as important, for even if the bicycle is a beater, dressing like a yellow bin bag is never a good look. 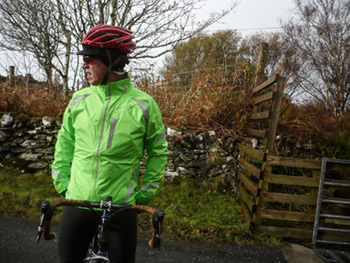 happily there are a number of cycle clothing purveyors who have taken note of our need for sartorial excellence, not least of which is edinburgh's endura clothing. they may well be the clothing sponsor for formula one's movistar team, but they obviously haven't forgotten the ordinary man in the street. 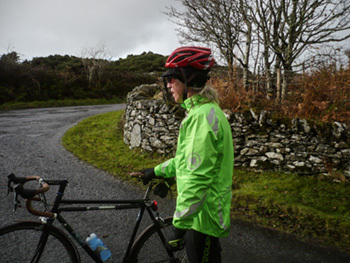 their new luminite jacket is an exemplary example of just how endura's design and consideration sits very near the cutting edge. there are so many clever features incorporated in this jacket, it's hard to know just where to start. the pelotonese are desirous of pared to the bone utility, while the commuting cyclist has differing needs, including two zipped front hand pockets, a zipped chest pocket with grommet to allow use of an ipod, a large, zipped rear pocket and a zipped, mesh-covered vent under each arm. to ease opening and closing of all those zips, especially with gloved hands, there are easily graspable toggles and the collar, though not too close fitting is propitiously high. 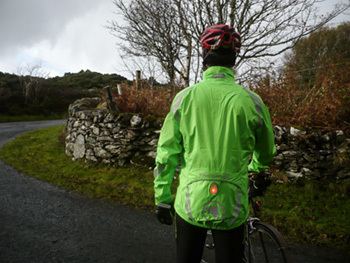 the luminite jacket does, however, have an ace up its sleeve or, to be more accurate, behind a liner at the back of that rear pocket. 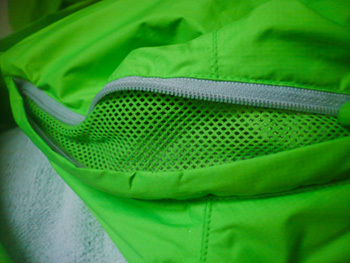 slotting into a tab attached to the inside rear of the jacket is a battery powered led, shaped to sit inside a green-tinged, clear membrane at lower centre of the back. though it's nigh on impossible to switch the light on (it has three distinct modes) while wearing the jacket, not least because, unless you have a mirror nearby, there's no way of telling whether it's on or not. of course, light emitting diodes are less than keen on being immersed in soapy water, so it's advisable to remove it prior to chucking the jacket in the washing machine. the light is shielded from anything you might be carrying in those rear pockets by an internal flap, one that will also catch the light should the owner fail to fix it in place properly. the attention to detail is also quite impressive: the button to switch the light on and off features an embossed endura logo. each cuff features a lengthy velcro strap to vary the closure over gloves, and the sleeves are of impressive length. even with the toggles on the zips, i failed miserably to open or close the underarm vents while riding my bicycle. perhaps it's the inflexibility of the ageing process, but since commuting is hardly as onerous as sprinting for the finish line, there's no shame in stopping for a moment or two to adjust as required. of course, all this would amount to little more than a bundle of fluorescence were it not for the jacket's permeability skills. advertised as windproof, breathable and waterproof (the entire jacket features sealed seams), it scores very highly on the first and last of those three. we're never short of wind over here and i have become adept at separating the good from the bad with respect to that aspect. additionally, over the course of the review period, i managed to get myself very wet indeed; or rather, i didn't. despite considerable wind-driven precipitation for several lengthy periods of time, the rain failed to gain entry. 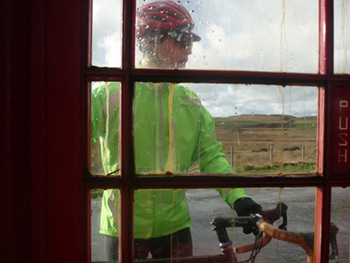 unfortunately i have yet to meet a cycling jacket that's as breathable as i need it to be; those sold as totally breathable tend to let in some rain eventually, while the totally waterproof will always encourage perspiration to hang about longer than desired. the endura luminite is most certainly not the worst by a long way, in fact, it's probably up there with some of the best, but it doesn't quite hit the spot. i seriously doubt anything ever will. however, in mitigation, my commute incorporates neither theobalds road nor kelvin hall. i am in possession of a more rural commute between bowmore and debbie's in bruichladdich, and i don't always take the most direct route. and it's not possible to check the windproofing without pushing hard into the wind. these may not be conditions met so often when intent on reaching the office in timeous fashion. i did have an initial problem with the flashing light; it set off ok, but on reaching my destination it was found no longer to be working. that, however, turned out to be pilot error, due to my having not tightened the battery cap properly. once corrected, it fulfilled its duties impeccably. i almost wish i had a proper commute, for though fluorescent green may not match my eyes, there's no way anyone could say they didn't see me coming. and apart from that, it's brilliant in every sense of that word.